Whether you need extra money or space, sometimes selling a doll collection is necessary. This is a guide about selling collectible dolls. I read most of the questioners about a way to sell "collector dolls". I am a collector also, and it hit me that maybe I should suggest the TV show, "PAWN STARS" might just be interested. having to go to Vegas to deal. I have a Suzy Walker walking doll bought in 1947, with original shoes and socks, and original ribbons on her hair. What is the worth today? i found an interesting McCall's article from 20 years ago that claims it is not worth as much as one thinks: "A 1951-55 Ideal Saucy Walker doll in very good or better condition has a value in the $100 to $150 range. Your Suzy Walker doll has a value between $25 and $30 in fine condition and without her period packaging. Her collecting interest is primarily curiosity. However, she has enough value to avoid a trip to the Salvation Army or landfill." I have somewhere between 1000 to 2000 dolls that I would like to sell. I would like to sell them all at one time. What is the best way to do that? Hello neighbor I just want to give you a heads up, my father had a train collection and we went to collectors asking what they were worth if we wanted to sell them and they were offering us rock bottom prices even under bidding and taking advantage of an innocent persons ignorance on the subject. A friend suggested we ask collectors their value so we could insure them and we actually got prices 3 and 4 times more than what we were told when inquiring on selling prices. Trust no one unless u get the real value thru the "insurance" metaphor and then you will know the asking price and the true value of your dolls. Wow! That is a lot of dolls! There are several factors to consider; such as the maker and condition and if any are still in boxes. You would have to do a lot of research and as stated before; get more than one opinion. Dolls are very plentiful on the Internet so it is difficult to receive a "good" price, even for valuable dolls and "regular" dolls sell for only a few dollars. You may be "lucky" and find someone who wants this many dolls. I personally would estimate that - if sold as a lot - you would only receive about .25 to 50 cents per doll. This may sound low but I have a lot of dolls and do not kid myself as to their "true" value. Some dolls purchased 20-30 years ago - at prices well above 100.00 are now worth 15-20 dollars. Of course there are always exceptions. Good luck and I hope you make a lot of money! Were you able to sell this large group of dolls? If so, how did you do it? I have some authentic porcelain dolls that I have been wanting to sell. Is there any place or person that buys them? I would greatly appreciate some help. Thank you. I have the complete set of the Effanbee Legend series dolls. I need to sell. How can I find someone interested in these dolls? Hi - not sure how many dolls you have as there is a very large number in the Legend series. A large group may be difficult to sell unless you have a local auction that deals in that type of merchandise - and a group will sell for a lot less than selling individual dolls. Check your dolls on eBay, Ruby Lane, Amazon. Google dolls by the series or individual names. You can get a good idea of what people are asking for each doll. Selling dolls at a decent price through these outlets takes a lot of work and time (usually months) unless you list them at a very low price. Groups sell but at a much lower price per doll. You might find a local shop that would be interested in buying as a group but expect to be quoted a low price (maybe even 10.00 per doll). Shipping is another story altogether! Dolls are difficult to ship so try to stay with local pickup. Selling on Craigslist can be done also but be very careful who you invite into your home to view your dolls. Question: How Do I Sell Collectible Dolls? I have several dolls I need to sell. How do I go about it and who could I contact to sell them? I have Prince Charles and Princess Diana wedding dolls, Elvis, Marilyn Monroe, 3 Bob Mackie dolls, and 2 Princess Diana dolls, one in a white dress and one in blue velvet. I think the best place to start would be Ebay. It's easy to set up an account and you can list them under antiques. You can even set a minimum bid. I would find a local auction that auctions collectibles. Where can I buy used porcelain baby dolls to sell later? I am in Antioch, Illinois. Where can I sell a porcelain doll really quickly? Our family tended to buy dolls in the costumes of various countries. Most of the 30 or so I now have are at least 50 years old and do not have manufacturer information. What's the best way to find a good home for them. We don't necessarily want to sell them. Same question for about 10 story book dolls in original boxes. They have never been undressed or played with other than careful holding. I would like to sell my Vanessa Ricardi dolls. All are NIB. Years 1998-2000. Where is the best place to sell and determine their value? eBay has listings, but not of my dolls. Go to dollreference.com to determine what they are worth and then you can put them on eBay. eBay is still the best place to determine the value of most any doll even if they do not have your particular dolls. Current listings can tell you what a seller is ASKING but sold listings can tell you what someone was really willing to pay and completed listings can tell you what did not sell - at least over the last 30 days. You may have to keep checking but if prices are low (or high) for dolls in your series/years/condition then most likely that will be the close value of yours. Dolls of almost any kind are very slow sellers (an eBay seller may have a doll listed for weeks/months/years) and very difficult/fragile and expensive to ship. We do not know what dolls you have and general information is too vague so you may have to continue the search with your dolls "in hand". My mother bought me this doll years back. It is a vintage 16" porcelain Vanessa Doll Collection Series 1995. 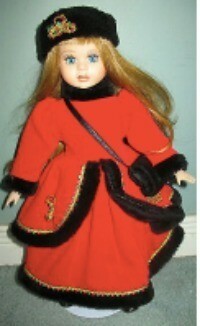 It is dressed in a red and black coat and skirt. I was wondering how much it could go for now. I was thinking I could probably sell it for $200.00, but I wanted to know if that is way over or under the price range I should aim for. I have scoured the internet and I have yet to find 2 exact replicas of this doll. The only other replica I found was taken off of the market and I am wondering if it is because it was worth nothing at all or if it is truly worth a lot. How do I sell porcelain dolls? I have a number of Kewpie Dolls, (Effanbee), in various sizes and colors. Do you have any idea where I can sell them? They are in the boxes with numbered certificates. sold doll prices which are shown in green and that's as current a doll value, as you can get. I agree with eBay. Look for a few weeks to see if they do sell. Make yours slightly less expensive than the others. How do I find a good place to sell some Barbie dolls? I have three Marylin Monroe Barbie dolls, Day in the Sun, Hollywood Cast Party, and Publicity Tour. They are still in their cases, they have never been opened. They are also their third, fourth, and fifth series. If anyone has suggestions for selling them please advise. Thank you. The advantages of Craigslist is you get cash and local people only see it. The advantages of eBay is that the world sees it and unless you put a "buy it now" option, bidding wars ensue for things two or more people want. Put Barbies in eBay and you will find thousands, but it will also give you an idea of what they are selling for. I have sold 18 on eBay over the last 12 months, so it's a toss up as to which one I like best. Due to difficult economic times, I am selling off things to bring in some money. I have several collector dolls from places such as Ashton Drake Galleries, Danbury Mint, Franklin Mint, that are closed issues now. Where is the best place to try an sell them? eBay doesn't seem to bring good sales for collector items. I have a friend who needed to sell her stuff she had the best luck at community flea markets or church sales. Look on ebay and look at sold only to see what your type of doll has recently sold for. The post the for sale on Craigslist in your area. You might need to keep re-posting every week. Craigslist is free and the best way to sell. Selling on ebay is OK but you take a risk on the price and dolls aren't selling so good right now plus you have the packaging and shipping issue. You might have better luck selling all the dolls together as a 'lot', people seem to really like this. You won't get what you paid, so just decide on an amount and post them. Don't let greed get in the way of cash in hand. I have a Patty Play Pal doll that is 58 yrs. old I would like to sell it . Can you point me in the right direction? I have a boxed 20" Ashton Drake Gallery doll with certification of authenticity. It's a real life like doll with baby clothes. I wish to sell it either directly or to a collector,not via eBay or gumtree. Please can you give me some advice? Thank you. I have a doll, Emily, of American Girl, Mary Kay collection. She is 18 inches, she is #4 of 50, from 1993. She is in her original outfit and in like new condition, no box. I have a least 10 collectible dolls for sale. I'm Melbourne Florida. I need to know the value. They are 10 to 15 years old. Check out answers on Thrifty site. Go to the top right of your screen and put porcelain dolls in search area... lots of information. 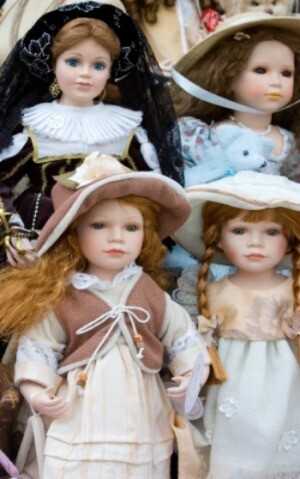 I am trying to sell four dolls. Their names are: Brook D-24, Victoria Ashlea, Megan #46026, and Kristal # 0099 1200. Any suggestions? Google their worth. Then, see what people are selling them for on eBay, then decide if you want to take the hit on money whether you sell them or not. Try Craigslist but be prepared for spammers who just want you to link to their sites and make money. Sometimes a consignment shop is best. They pay for the advertisement, keep some and you get the rest. Your items are insured, and you can always take a photo of them and post it on facebook... thus giving them a shout out. Good for everyone. And finally, if you have facebook friends who love dolls, announce their sales on there. Good luck!! How can you find someone to buy collectable dolls? Hi - this question is asked almost every week and the answer is almost always the same. eBay is the biggest site for selling things like this. Do your research at eBay and Google. You will most likely be disappointed with the price they are selling - if they sell at all. I have a large collection of ceramic dolls from the 20s and 30s to sell. How do I find buyers? Hi - you will have to go to eBay (takes lots of photos) or Craigslist. You need to check out each doll on Google and eBay.